CARB has proposed significant changes to the Red Sticker program. The changes would eliminate all Red Sticker bikes within a few years. I won't go into details...here's a link for input from Don Amador, D36 Legislative Action Officer: https://thegeneralsrecreationden.blogspot.com/2019/03/opinion-is-ca-red-sticker-plan-final.html Here's the site to submit your comments to CARB. It's best to do so several days before the 22nd so the comments have time to be collected for the Board. https://www.arb.ca.gov/lispub/comm/bclist.php Click on the 4th entry, "ohrv2019." Thanks for asking. Just under 32,600 miles. No engine work except for tune-up and maintenance stuff. $2300 Bonus: If it sells through SDAR , a $100 donation goes to the club. 2nd Bonus: 2020 registration just paid. Ready to ride: Less than 400 miles on Pirelli MT90 tires. 600 miles since oil & filter change, new F&R Galfer brake pads. Ditto for brake fluid & coolant changes, air filter cleaned. The bike is mechanically solid even though the bodywork may not be spotless. It's been my Baja ride for a few years and was built to be reliable and comfortable. There's a long list of updates and changes: 3+ gallon gas tank Professional suspension revalve by FBI. Rear linkage & swingarm were rebuilt with all new bearings & seals. Seat Concepts custom seat. Oversize rear soft pack. (OEM bag included) Custom side panel protectors, left & right. Custom seat rack. Muzzy complete exhaust. (OEM included) Acerbis LED tail/brake light. DEVOL radiator guards & rear disc guard. MSR extended shift lever. Upgraded footpegs: IMS SuperSport. (OEM included, plus passenger pegs) SFB Racing billet aluminum clutch cover. Steel protection plate on alternator cover. Heavy-duty bash plate. Carb rejetted, opened airbox, TwinAir reusable filter. OEM tool kit! Gearing of 15/41, spares of 14/44 if you want to win the stoplight sprint. Hey, I told you it was a long list. Many other benefits: Owner & service manuals, ss brake lines, bar risers, upgraded silicone hoses, compact rear turn signals, external fuel mixture screw, 12V outlet, several spares. The KLX400SR is exactly the same as the DR-Z400S [DRZ400S] except for the color of the bodywork. In 2002-2003, Kawasaki made a deal with Suzuki to provide the bikes so Kawi would have a mid-sized DP model. I buy parts at the Suzuki dealer. Ooooohhhh..... That list of mods leads me to believe you knew what you wanted. Since I started riding on 2-stroke street bikes, ring-a-dings will always be the ultimate. Fingers crossed for the street version. AFM24 replied to jawhitmoyer's topic in BAJA Info, Upcoming Baja Rides, Ride Reports, Baja PHOTOS, etc. Yeah, the first trip to Baja is always a treat. Actually every trip to Baja is a treat. Here's my pic from the first visit to Mike's. Kind of a bummer being the only guest. AFM24 replied to AFM24's topic in BAJA Info, Upcoming Baja Rides, Ride Reports, Baja PHOTOS, etc. Thanks for the quick replies. I'll check it out, and next time I'll first check the map for the correct spelling of Hanson and Compadre. 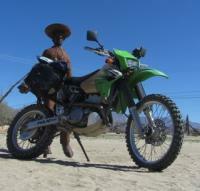 AFM24 posted a topic in BAJA Info, Upcoming Baja Rides, Ride Reports, Baja PHOTOS, etc. How does the road past Laguna Hansen compare to Compadres Trail? Technically, I mean. A buddy and I are in San Felipe now and thinking about using the Laguna Hansen option to Tecate since we've covered Compadres Trail twice before. BTW, I'm on a Buell Ulysses with 17" Conti Trails--there's nothing "trail" about them but I can easily handle something like Compadres or Coco's. Just one of many helpful guys I need to thank. Jim loaded the GPS files onto my Garmin and I figured out how to use 'em on Saturday morning. Big thanks to all the volunteers that make Desert Dash happen. This was my first time and I had more fun than I could believe. AFM24 replied to rsiberell's topic in BAJA Info, Upcoming Baja Rides, Ride Reports, Baja PHOTOS, etc. Thanks for the replies. I have a Garmin Zumo 550; designed mostly for the street but okay off-road with the biggest difference that I don't have topo. Not an issue for this weekend. If nothing else I should be able to get the routes onto an SD card. A question I didn't get the chance to ask at last week's meeting: How do I get the GPS tracks onto my GPS if we don't get the file in advance? I'm not bringing my computer to the Dash. Randy's told me that there's also a roll chart but never having used one of those I'm reluctant to count on figuring it out while I'm riding on new trails. BTW, it was nice to meet a few of y'all at the meeting. Looking forward to meeting more this weekend. Can Anyone Host a Round the World French Rider Feb. 9-10th ? Hey there, SDAR folks. While I usually try to keep personal info off the Web, I don't want to be the new rude guy so here goes... We moved to VC full-time in September after visiting my wife's in-laws for nearly 30 years. Until a few years ago my riding was almost all pavement--several across-the-country loops and decades of road racing. I got a Buell Ulysses so I could follow the fire roads, and after taking that to places it probably wasn't designed to go decided to get something smaller. Right now it's a KLX400SR that's taken me to Baja and a week's ride through A-B and Joshua Tree. Those don't really qualify me for riding the Desert Dash, I suppose, but I signed up anyway--see some of you next month!